Hubby and I have been on the road this week. Yesterday, I received a head’s up from my forever friend, Julie, telling me about Perry Newburn. He would be attempting to run from New York City to Los Angeles in 46 days, while celebrating his 60th birthday and breaking a record. Imagine our delight and surprise, while traveling route 60 from Missouri to Oklahoma, in seeing an orange dot moving along the road. “There he is!” Down went hubby’s window as we yelled, GO PERRY GO! But that just wasn’t enough. I had to have pics and meet him. 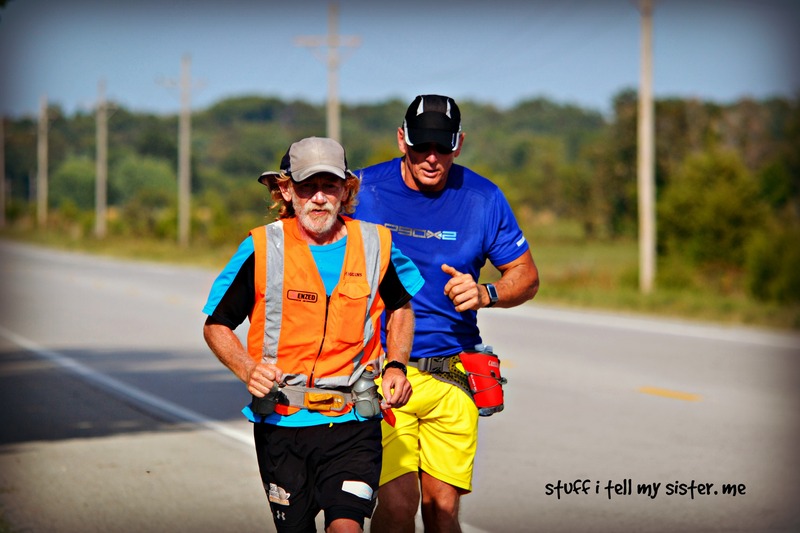 The next few minutes we visited with Perry and his Missouri running friend, as he shared a bit about his journey. We found Perry Newburn to be a true inspiration. His feet traveled 66 miles on this particular day. His determination…..amazing. 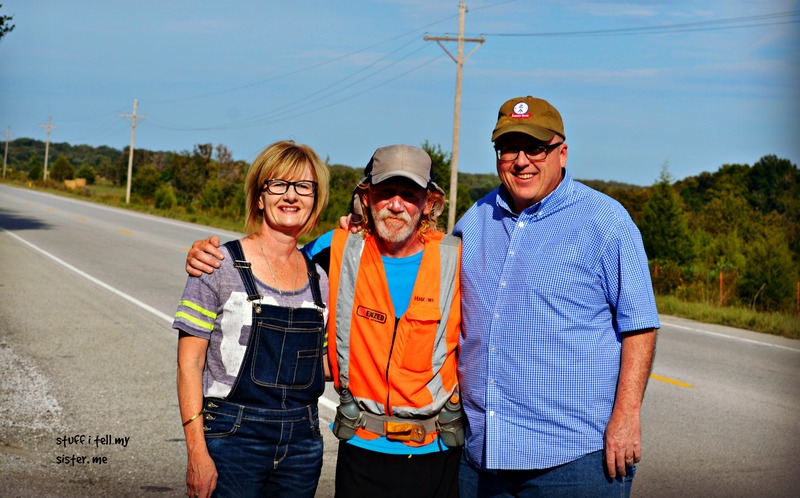 We had stopped to cheer him on, but he encouraged us when he spoke of the kindness he’d met along the way. If you have doubts about humanity, do this. It will renew your hope. Perry told us this just before parting ways. GO PERRY GO! and HAPPY BIRTHDAY TO YOU! 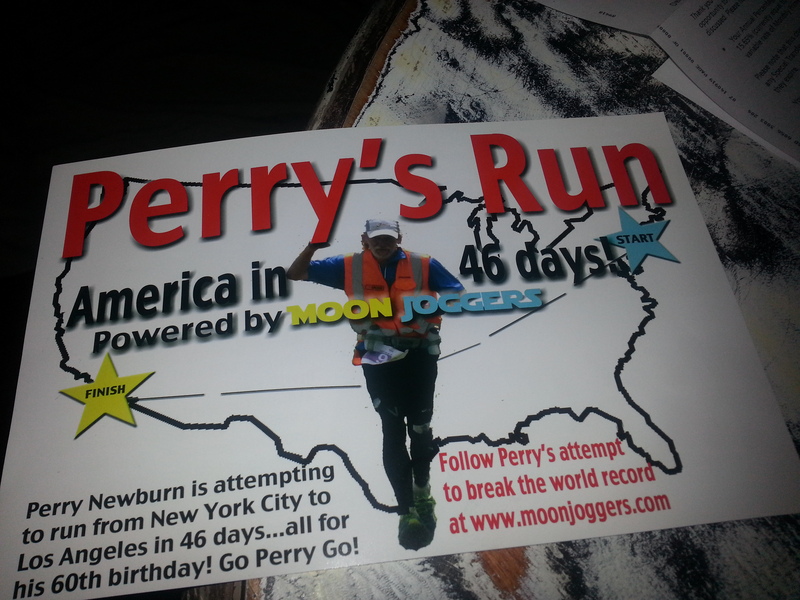 This entry was posted in Uncategorized and tagged America in 46 days, Go Perry Go, moonjoggers, Perry Newburn, Perry's Run, Route 60, Running for a cause, vacation surprises. Bookmark the permalink. 24 Responses to Go Perry Go! Perry was a delight to meet….as was Angie and company! We are having so much fun following his travels now! His goal is in sight and he is determined. Warmer afternoons for him yesterday and today…but on he goes. We are sending up lots of prayers for his safety and well being! I cannot begin to imagine…. awesome that YOU CAN!!! Amazing guy! What a neat experience you had to meet him and I’m sure encouraged him too! His determination is something else, Jeannette. He starts around 4 a.m. and ends well after dark….only to begin again. A wow adventure!!! What an incredible goal! Amazing … Go Perry Go! We are cheering him on….hour by hour! That is awesome, im so pleased for him. Wishing him safe travels. Day 27 today I think. It is warming up in the afternoons right now…so I don’t know how he does it. But on he goes! Go Perry!! He is an inspiration and proof that age ain’t nothin but numbers. Awesome! Woo Hoo!! Now that’s a way to celebrate! Isn’t it? He crosses into Texas this morning! Oh, wow! What an adventure, and what a way to toss steroetypes out the window and help us see past the white hair. GO, Perry, GO! His journey has been so much fun to follow! He should cross in to New Mexico sometime today! So proud of his goal and accomplishments. #goperrygo!